New Zealand's first Christmas: Explore the first planned European settlement where Māori and Europeans learned to live side by side. The Marsden Cross memorial, erected in 1914, marks where New Zealand's very first Christmas Day was celebrated in 1814. The service was lead by Christian missionary Samuel Marsden and witnessed by Māori who lived in the adjacent pā. The day marked the start of New Zealand's first European settlement, a situation that was only made possible because of the protection of powerful Chief Ruatara who had an understanding with, and respect for, Samuel Marsden. Tohu Whenua are places that have shaped our nation and created our stories. History comes to life at these significant places. See the Tohu Whenua website or follow us on Facebook, Twitter and Instagram. Rangihoua Pā and Kainga (village) was the local town at the time of the mission settlement, home to many hundreds of people including Chief Ruatara, Māori leader and friend of Reverend Samuel Marsden. The people of Rangihoua Pā were the protectors of the settlement in its early days. Today only a few terraces remain of the first European settlement established by the Church Missionary Society at Rangihoua Bay in 1814. In 1832, the settlement moved to more fertile land at Te Puna, a few kilometres to the west. The Rangihoua Heritage Park has good signage which fully describes the events that took place there and introduces these early personalities. Visitors today enter through a spectactular memorial building, built for the bicentenary in 2014. Site panels tell the stories of a variety of the participants. A 15-minute walk down the path leads to a hidden gem: an undeveloped beach in the Bay of Islands and the 1814 Christmas site. The drive from Paihia takes 50 minutes. Marsden Cross marks where the Reverend Samuel Marsden preached his first sermon on Christmas Day 1814. The terraces that you can see on this slope today are where the missionaries’ homes were and also the country’s first school house. There are cultivation lines running down the slope that may be the gardens Marsden’s travelling companions referred to as “plantations of kumara, potatoes and other vegetables”. Further up the slope there is also a stone memorial to the Rangihoua mission and those that are buried here. An archaeological investigation was carried out at Oihi Bay/Marsden Cross - a joint project between the University of Otago and DOC. Drive north from Whangarei on SH1 for 55 km. At Kawakawa turn sharp left and continue on SH1 for approximately 12 km. At Pakaraka (not a township) take a sharp right onto SH10 (this is signposted but easy to miss). At the signposted Kerikeri turnoff (Kerikeri Road on the right), go straight through the large grassed roundabout, staying on SH10, and continue heading north towards Waipapa. Continue approximately 2-3 km north past Waipapa, then turn right into Kapiro Road. A few km along turn left into Purerua Road. Stay on this road for apprimately 13 km then turn left into Rangihoua Road. Drive another 5 km (approximately), you will pass the entrance to Mataka Station on your left. After another few hundred metres turn into Oihi Road and follow it to the top of the hill. The carpark for Rangihoua Heritage Park is on your right as you crest the hill. 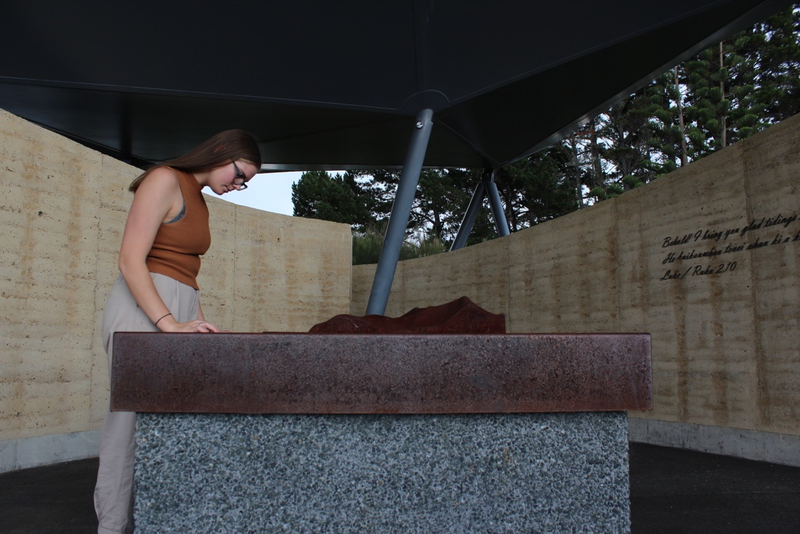 Experiencing Rangihoua Heritage Park – the site of New Zealand’s first Christmas service and the first place Māori allowed English missionaries to settle.